Flaxseed, millet and chia seeds. Gluten free wholegrain oats. High fibre. No GM ingredients. No artificial colours, flavours, preservatives or hydrogenated fat. Suitable for coeliacs or vegetarians.Naturally, oats don't contain gluten but can be contaminated by other grains. Nairn's gluten free oats are carefully sourced, farmed and milled to ensure they are safe to eat. We bake all our products in a dedicated gluten free bakery, testing every batch to Elisa standards. 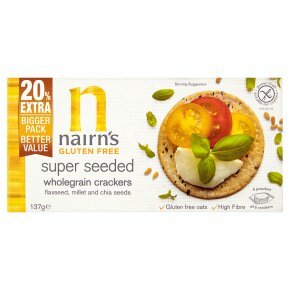 Nairn's wholegrain crackers are packed full of wholegrain oats which are naturally delicious and can contribute to a healthy, balanced diet. Wholegrains are a rich source of fibre, vitamins and minerals - oats are high in soluble fibre and also naturally contain manganese, phosphorus, magnesium, zinc, iron, folate, vitamin B6 and thiamin.